The White 9mm upvc Fascia Cover Board is also known as uPVC Cap-over fascias, or cappit board. Typically used to cover existing timber fascias or bargeboards which are in good sound condition and replacement uPVC fascia installations where timber or plywood backing boards are used. These 9mm C.. 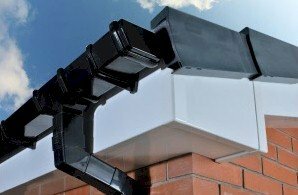 The White 9mm Cover Board is also known as uPVC Cap-over fascias, or cappit board. Typically used to cover existing timber fascias or bargeboards which are in good sound condition and replacement uPVC fascia installations where timber or plywood backing boards are used. These 9mm Cover boards ..
12m Pack = 3 x 4m Lengths GutterBrush is a gutter filter that fits easily into your rainwater system, designed to keep it clear from any debris such as moss and leaves all year round, whilst still allowing water to flow freely. Installation: Remove any debris. Lay the GutterBrush in the.. Description Flat UPVC Plastic Soffit / flat board / General purpose board. Use as soffits under the eaves of your roof or as a general purpose flat board, use 30mm Pins to fix or an edge channel if you wish to avoid pins showing. Colour: White Dimensions: 9mm x 100mm x 2.4.. Description Flat UPVC Plastic Soffit / flat board / General purpose board. Use as soffits under the eaves of your roof or as a general purpose flat board, use 30mm Pins to fix or an edge channel if you wish to avoid pins showing. Colour: White Dimensions: 9mm x 100mm x 5m .. Description Flat UPVC Plastic Soffit / flat board / General purpose board. Use as soffits under the eaves of your roof or as a general purpose flat board, use 30mm Pins to fix or an edge channel if you wish to avoid pins showing. Colour: White Dimensions: 9mm x 150mm x 2.4.. Description Flat UPVC Plastic Soffit / flat board / General purpose board. Use as soffits under the eaves of your roof or as a general purpose flat board, use 30mm Pins to fix or an edge channel if you wish to avoid pins showing. Colour: White Dimensions: 9mm x 150mm x 5m .. Description Flat UPVC Plastic Soffit / flat board / General purpose board. Use as soffits under the eaves of your roof or as a general purpose flat board, use 30mm Pins to fix or an edge channel if you wish to avoid pins showing. Colour: White Dimensions: 9mm x 175mm x 2.4.. Description Flat UPVC Plastic Soffit / flat board / General purpose board. Use as soffits under the eaves of your roof or as a general purpose flat board, use 30mm Pins to fix or an edge channel if you wish to avoid pins showing. Colour: White Dimensions: 9mm x 175mm x 5m ..